I’m very excited to be attending SDCC again this year, and have now finalised my schedule. This year I’ll be signing for IDW, Titan Comics and DK books, and appearing on panels to talk Star Wars, Pacific Rim, Doctor Who and maybe more. 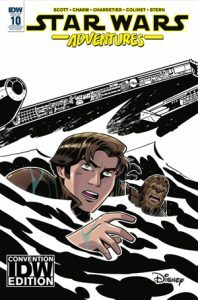 Don’t forget that a convention edition of Star Wars Adventures #10 will be available from IDW’s panel featuring an exclusive black and white cover by Derek Charm. Only 500 copies are available, so make sure you swing by the booth to pick up your copy – and get it signed, of course! See you there! And if you’re not going, keep up with what I’m up to on my twitter feed and instagram. Read a Han Solo comic for free!